Long $gold and short EURUSD. I don’t have much time today, so just updating the chart. I entered a long position for gold from $1172. Stop loss at $1159. In ideal scenario, $1194 will be the target. I also entered a short position for EURUSD from 1.3130. Stop loss is at 1.3277. Ideal initial target is 1.2950, then 1.2700. 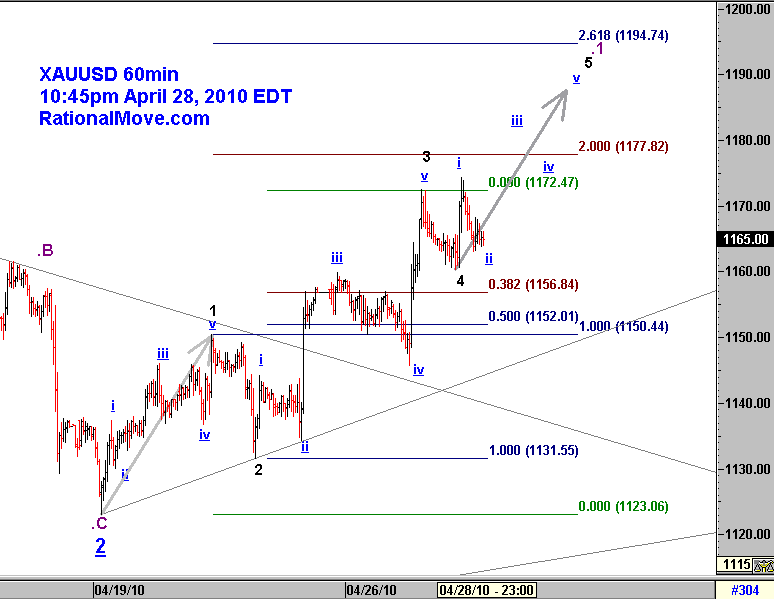 I was meaning to update the gold chart with Elliott wave count. It feels like the sudden surge to $1170 is already a past after the market got scared with Goldman Sachs news. But as in this daily chart, I am waiting the right time to buy for the mid and long term. But only for the few days, I will probably on the sell side. I have not decided if it is worth trading yet, but if the price crawls up to the trend line resistance, or where I marked as purple .B in this 60min chart, I will consider initiating and holding a short position along the purple arrow towards purple .C before buying gold. 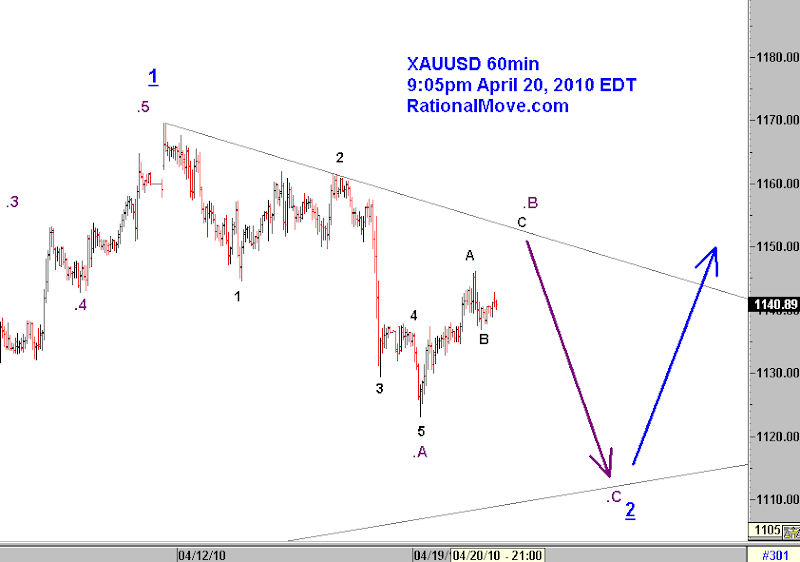 $GOLD Mid-term bullish scenario., originally uploaded by Rational Move. I was very bearish to the gold price before I met Elliott wave principle, mainly because of the weak actual demand of the gold and already higher price compared to the average production cost. 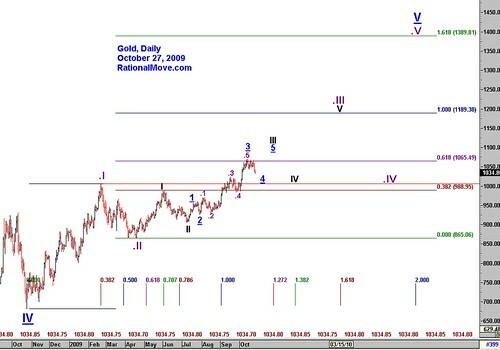 A couple of months ago, I heard the news of gold breaking up the highs, I started to hold my bearishness of the gold, and I applied a very rough Elliott Wave Analysis on monthly gold chart. Today, I was reading the quarterly Gold Investment Digest from the World Gold council, which you can download the report free from here. 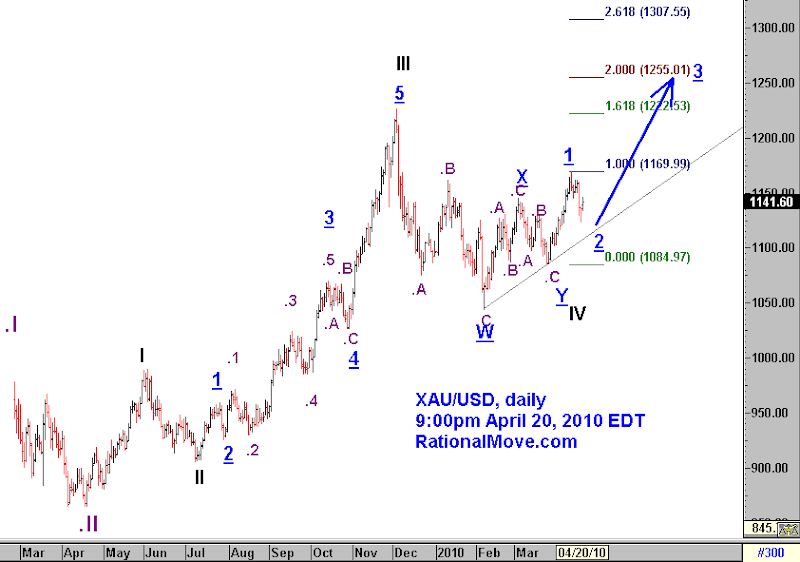 I started to think again about the future of the gold price, and did a thorough Elliott wave analysis. 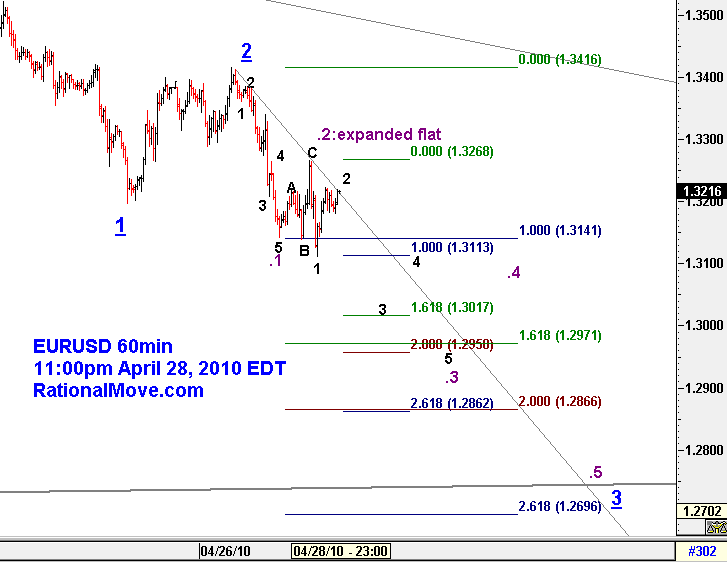 The above chart is my Elliot wave labels with bullish scenario. The labels for the future price points are idealistic one, but it is not a an overly optimistic one either. I started to think we can be profitable by buying gold at the end of each correction (IV labels in different degree), probably until the summer of next year. Economic recovery is still very weak, and jewelry demand is very low. European central banks are selling gold, and so will IMF. Gold price is well above the average production cost. Economic recovery may continue to be weak in the west, but stronger in Asia, and the gold demand is strong in Asia, especially India and China. The CBGA (Central Bank Gold Agreement) countries are selling, but non-CBGA countries are buying gold, and China may swallow all the sales from IMF. Jewelry demand declined to 1971 tons or -2% yoy, but investment is growing rapidly to 1683 ton or 152% between Q3 08 to Q4 09. Gold price is not cheap any more, but the concerns about the inflation are not negligible either. Also the commodity price actions tend to show the extended rally at the very last stage.